one happy little crafter: When the Crafty Friends got Cute! Hello there, my dear and lovely friends....hope you've had a great week and the weekend has got itself off to a good start. It has been a busy old time here this week - last weekend I had to work all day on Saturday and then went to the Sincerely Yours craft show in Maidstone....shame to see some old favourites not there this year, but still managed to do some lovely crafty shopping! 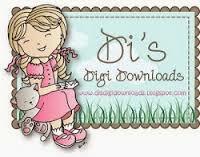 I know you won't be able to resist this theme, so hop on over to join us and also check out the other gorgeous DT cards! Hoping to squeeze in a little crafting time this afternoon - we are doing a craft fair in June and really need to get cracking on our "makes" - I have a head full of ideas, just need a few extra hours in the day, and I'll be just fine, lol! Yep! a REAL cutie, so pretty in the pink and blue. This definitely is cute! Love the blue and pink combination of papers and colouring. A lovely clean looking design if you know what I mean?. Love it! So gorgeous Lisa, love your super cute image. 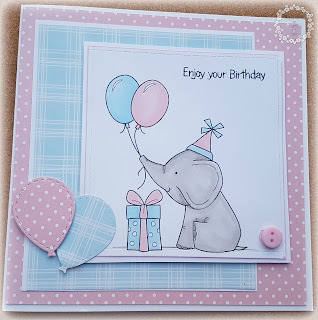 Thanks for creating your gorgeous DT card for our latest challenge at Crafty Friends Challenge Blog... The elephant is so cute. I am so pleased you are on the Team. Have a lovely day.